JANSSONIUS - Mar del Zur, Hispanis Mare Pacificum. JANSSONIUS, J. - Mar del Zur, Hispanis Mare Pacificum. Mar del Zur, Hispanis Mare Pacificum. - JANSSONIUS, J. Title : Mar del Zur, Hispanis Mare Pacificum.. Size : 17.2 x 21.3 inches. / 43.8 x 54.1 cm. Description :Janssonius' fine chart of the Pacific including the west coast of America with California shown as an island, Japan and a small Australian coastline. 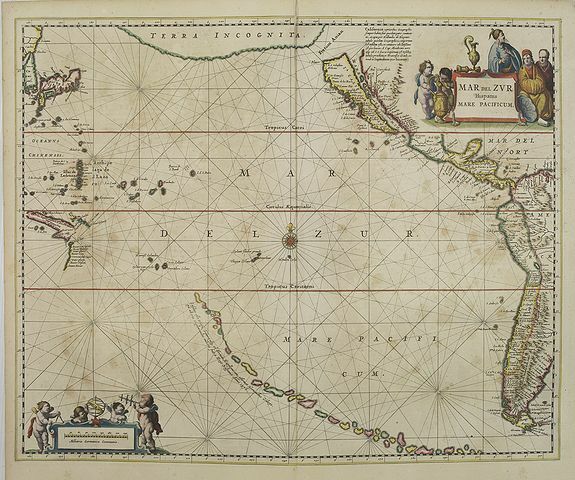 This is the earliest sea chart of the Pacific to appear in a Dutch Atlas. Japan and the Philippines are shown but are misshaped and wrongly placed. New Guinea is shown as a fictitious chain of islands stretching halfway across the Pacific, being based on an idea from reports of Magellan's voyage. California as an Island with a flat northern coastline from C.Blanco to C. de S.Lucas with the Vermillion Sea and Coast of Pearls. Decorated with rhumb lines and a compass rose at the very center of the map. Burden, America 292, state 1. Tooley, The Mapping of Australia 749. Condition : German text on verso. Usual paper browning and overall light brown spotting. Good condition.